As the blood of martyred Christians runs through Rome's catacombs, Pope Sixtus entrusts their most sacred object to a devoted follower. Soon after, the Holy Grail disappears into the darkness of time. While overseeing the evacuation of the English colony of Tangier, Samuel Pepys attempts to retrieve a treasure which has resurfaced after more than a thousand years. Meanwhile, a Jewish merchant is tortured by the Altamanus, a secret group determined to locate the Grail. Gibbins, who has led numerous underwater archeology expeditions around the world, writes with an authority that makes “the astounding seem more than plausible” (Parmenion Books). This latest Jack Howard novel brings together historical details and a thrilling plot for an action-packed adventure that’s perfect for fans of Clive Cussler and Dan Brown. A new Jack Howard thriller is like a new Dirk Pitt adventure - a literary addiction I cannot refuse. I love stories that cover long spans of years, so I'll definitely have to check this out! This would be an interesting read, especially the Holy Grail being part of it too. Great pick. This sounds like an awesome reads!! I hope you get a chance to read it! 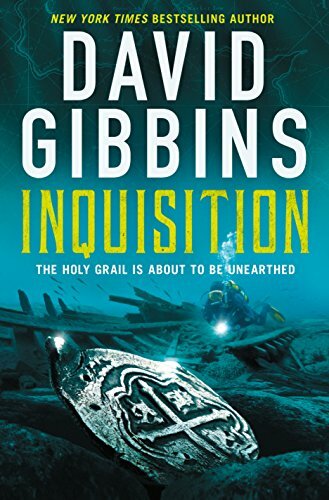 I've seen David Gibbins' books around, but I've never read anything by him. Would love to try sometime.